An Argentinian (Henry Stephenson) instructs his son (Don Ameche) to travel to New York and sell his prize horses to anyone except family members of socialite Binnie Crawford (Charlotte Greenwood), whose brother cheated him years ago. Naturally, Ameche falls in love with Greenwood’s niece (Betty Grable) — who is interested in buying one of his horses — and makes an excuse for being unable to sell one to her. Grable travels to Argentina to learn more about Ameche’s odd behavior, and soon the couple are hiding their romance from Stephenson. 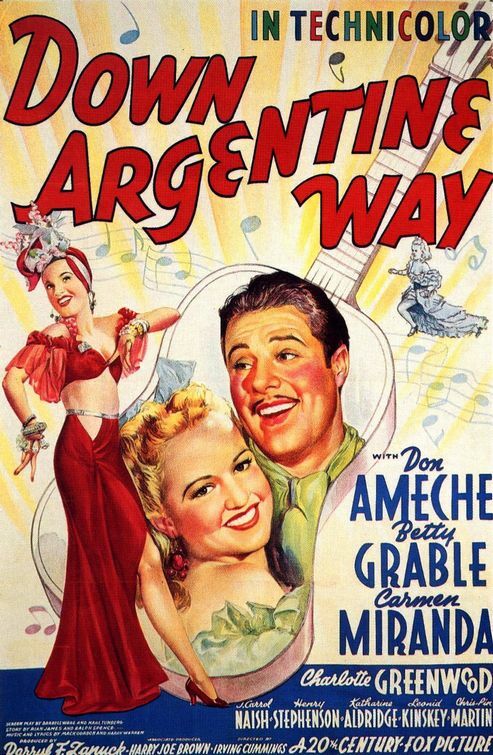 There’s something eager-to-please about [Grable’s] singing and dancing — she doesn’t have the laid-back, smart-alecky cool of, say, Ginger Rogers… Grable’s appeal in Down Argentine Way — even beyond those stunning legs, which would later be insured by Lloyd’s of London for $1 million — radiates from a place that has nothing to do with strict acting chops. She’s a persistently warm, accessible presence; there’s something kind and forthright about her. This is true enough, but wasn’t sufficient to hold my interest; and the final scenes revolving around race track shenanigans are pure filler. Skip this one unless you’re a diehard Grable or Miranda fan. No; feel free to skip this one. Listed as a film with Historical Importance in the back of Peary’s book. First viewing – yeah, skip it. Its original political intent aside, this seems clearly designed as harmless date night entertainment for 1940. Alas, it had little possibility of shelf life. 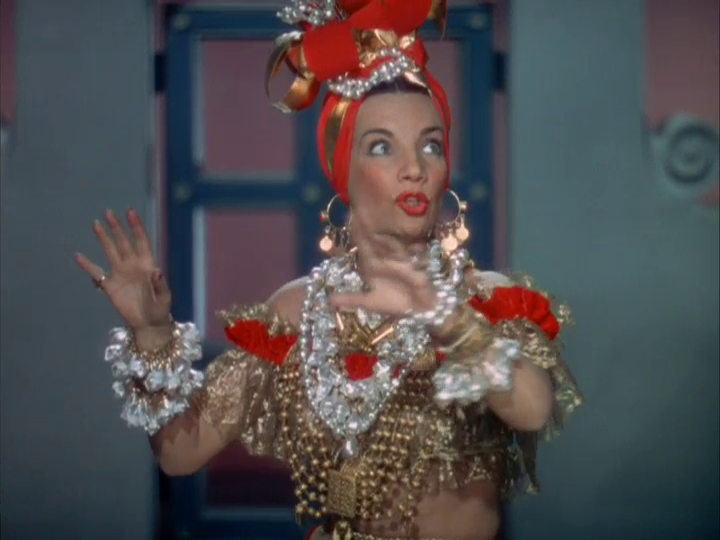 Miranda appears at the beginning and then, 30 minutes in, she sings two other songs – but, since she’s not at all integrated into the plot, her introduction to cinema will be of interest mostly to her fans (even if she’s somewhat reined-in here). 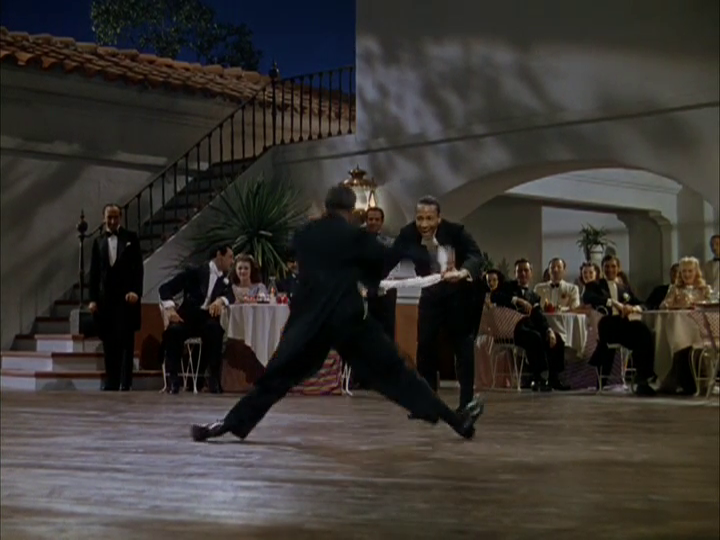 The specialty number by the Nicholas Brothers is indeed fun but you could probably find that on YouTube. It’s hardly a reason to see the whole film. The cast doesn’t have much to work with – even Greenwood is let down, with no real chance to shine in a comic sense. The plot is ho-hum and the film itself is largely forgettable.